Women's cycling is stuck in a vicious cycle. And it's one that has been spinning at a high rate for as long as I can remember. (I date back to 1983.) I saw it when Twigg, Bliss, Yeaton, Golay, Reinhart, and Pic were racing. It's still going. Lately, the cycle has received a lot of attention after the Amgen Tour of California held a women's event during the San Jose time trial. A lot of the issues came rushing forward. 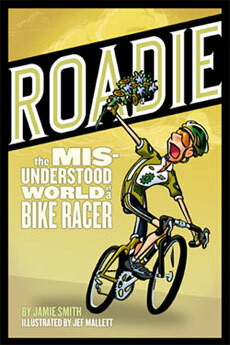 I touched on it briefly in Roadie (the greatest book ever written). The cycle: women's pro racing is less developed than men's pro racing in many areas: rider salaries, prize monies, and number/stature of events. This is due in large part to the relatively low number of female participants across the country. With fewer participants, fewer riders progress to the highest level. With fewer elite racers, there are fewer elite level events and usually lower prize lists at the ones that do exist. As such, it's not financially viable for a female athlete to become a full time bike racer. So what's a promoter to do when only only a handful of elite-level women show up at a regional event? They'll be forced to lump them together with lower categories in order to create a field. If you're that elite racer, you'll simply ride away from everyone. What fun is that? As I said in Roadie, if you enter your first tennis tournament and face Maria Sharipova in the first round. If that's your bike race experience, how long would you stay in the sport? The answer is "Not very long." In fact, roughly 90% of the first-year licensees don't return for a second year. Currently - in my region, anyway - a woman's only choice for a group training ride is a hammerfest involving 100 men. On Sunday, she will race against the other five women who didn't sell their bike after the first season, or they'll combine her field with another field (either the juniors or masters) which removes all semblance of a bike race. That's what women face upon entry into Roadie-world. Women's racing is at its best when women race within their own category. It's real bike racing. Exciting. Competitive. Interesting. Compelling. When women are forced to race all together as one big amalgam (which is 90% of the time), it is downright impossible to watch, and it's defeating to everyone involved. That - right there - is, to my trained eye, what kills it. The answer is not simple. It is not enough to simply put on more high profile races. It is not enough to simply offer more prize money. Those are bandaids. Those have been tried with disappointing results. Money doesn't solve it. Remember when USAC dumped a ton of money into the 1996 Olympic team thinking that medals would inspire growth in the sport. (For example, $25,000 for team pursuit "super bikes".) It doesn't work that way. It never does. It has to be organic. The better answer is to grow more bike racers at the grass roots level. Teach, nurture, cultivate, train, and develop new riders. Put more people into the pipeline. With more people, you'll have better racing. Then, by offering women-only training sessions and skills courses, we can provide a better environment for developing the sport. And then, cream will rise to the top without washing away the rest of the crop. It's a slow process that's already underway with several clubs and teams taking steps to recruit and train new women riders. When we get more numbers, we can stop forcing women to join a predominantly male group ride and stop lumping them in with the Masters or Juniors on Sunday. If your region isn't doing anything in this direction, start now.